Manchester United's Ademipo Odubeko celebrates with team-mates after scoring against County Armagh in the SuperCupNI Globe semi-final. Pic by PressEye Ltd.
A first-half header from striker Adempio Odubeko was enough for Manchester United to book their place in tomorrow’s SuperCupNI Globe final against Chivas Guadalajara after defeating a dogged County Armagh at the Coleraine Showgrounds. Manchester United should have taken the lead after just 19 seconds as a long ball by Teden Mengi was picked up by Shola Shoretire inside the penalty area. The classy midfielder crossed for Odubeko but his shot was expertly saved at close range by Armagh goalkeeper David Walsh. On nine minutes, Armagh were inches away from opening the scoring as Jesse Carson’s set-piece delivery just missed a vital touch from Jack Scott at the back post, before United goalkeeper Ondrej Mastny saved well from Matthew Willis. However, it was the English Premier League side who made the breakthrough on 12 minutes as Odubeko atoned for his previous miss by heading home from Samuel Peplow’s corner-kick. Despite the setback, Armagh began to grow into the game with Alberto Balde having a shot saved before Harry Evans fired wide with the goal at his mercy following a lovely team move. 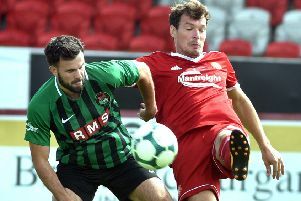 United – who missed out on the SuperCupNI semi-finals after losing to Southampton – had the perfect opportunity to double their advantage after Odubeko was adjudged to have been fouled by Walsh inside the area. United skipper Mengi took the penalty but Walsh dived to his right to keep out the spot-kick. On the stroke of half-time, Armagh had Walsh to thank again as the Linfield stopper was alert to keep out Anthony Elanga from close range. County Armagh started the second half on the front foot, with the dangerous Balde forcing Mastny into making a smart save. At the other end, Walsh was called into action to keep out Shoretire’s rasping drive after Odubeko’s strong run. The game began to lack any fluidity but it was County Armagh who threatened next as Scott’s flick-on found the run of Adam Wright. The substitute looked up and tried to chip Mastny but the United stopper was there to turn the effort over the crossbar. Moments later, a long ball over the top caused confusion in the United defence and Balde hit his effort wide with only the ‘keeper to beat as Manchester United held out to book their place in tomorrow’s final at Anderson’s Park, Coleraine.